Few months back, I stumbled on my Free Blogger Guide on free-ebooks.net while downloading some free ebooks from the site. I clicked on the Author link only to discover that it was not pointing to my free-ebooks.net profile. That same day, I submitted a ticket, requesting for the ebook to be moved to my profile. Few hours later, I received a reply that such will only be possible if I can verify ownership of the ebook. 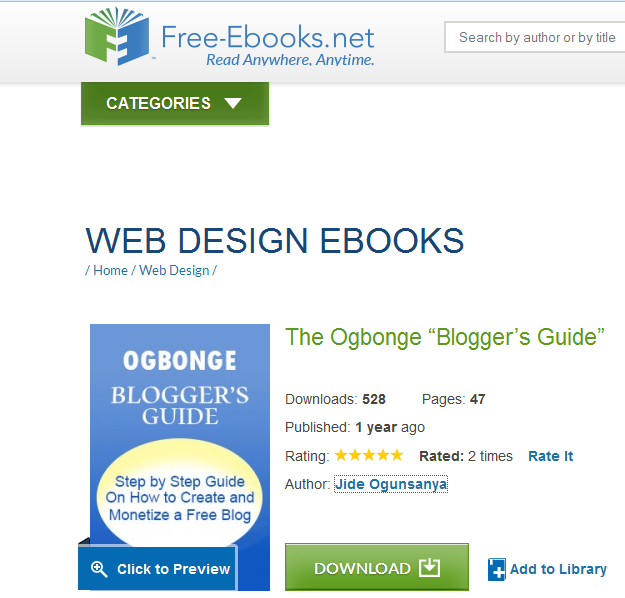 In the ebook, ogbongeblog.com and jideogunsanya.com were listed as my sites. To verify ownership of the ebook, I was required to send a mail to the support desk, using an email address from either of those two sites. I sent the mail as required and within 24 hours, the ebook was moved to my profile and I confirmed it via the "desk" tab on my free-ebooks.net dashboard. Now that it's been listed on my profile, I can now earn money from Google ads that display on the ebook's page at free-ebooks.net. More so, visitors to the page will be able to connect with me via my social media links and as well, visit my site if they wish to.